Can Damage from Excessive Drinking Be Reversed? Excessive drinking, binge drinking, and alcohol use disorder all damage the body. Acute problems from alcohol poisoning can put a person in the hospital, and consistent problem drinking of any kind, over many years, can damage nearly every organ system in the body. This can cause health consequences ranging from pain to behavioral disturbances to life-threatening cancers. Alcohol use disorder, heavy drinking, and binge drinking can all cause acute and chronic health issues. Some chronic health problems related to alcohol use disorder or problem drinking are listed below according to the specific disorder or system they affect. In moderate amounts – no more than one 5-ounce serving per day – red wine has been correlated with healthy cholesterol levels. Drinking more wine, beer, hard liquor, or mixed drinks, however, is likely to increase cholesterol. Problem drinking over years can lead to chronic high cholesterol. Also, damage to the pancreas, leading to chronic pancreatitis, can cause diabetes. These are fats found in the blood, which provide excess calories to help cells function; drinking alcohol, particularly beer or liquor, can increase the amount of these fats in a negative way. Too many triglycerides can lead to hardening of the artery walls, increasing the potential of heart disease or stroke. Alcohol interferes with the liver’s ability to release glucose, causing hypoglycemia or low blood sugar. This can induce diabetes in people who are prone to the condition, or it can make diabetes worse in people who are already receiving treatment. All kinds of excessive drinking can damage the heart. Types of heart damage include arterial fibrillation (a type of heart arrhythmia), cardiomyopathy (stretching and drooping of the heart muscle, so it does not beat very strongly), and inflammation (sometimes causing blood clots, which can lead to stroke or pulmonary embolism). Changes to the sympathetic nervous system when a person drinks excessively can raise blood pressure. While this is a temporary situation, consistent heavy drinking regularly raises blood pressure, and eventually, the condition becomes chronic. Digestive problems are a side effect of drinking too much, since alcohol can change the pH balance of stomach acid. It can also irritate the stomach lining, especially if a person struggling with alcohol use disorder stops eating regular or healthy meals. Gastritis, or an inflammation of the stomach lining, indigestion or acid reflux, and ulcers are side effects of a chronic drinking problem. Changes in digestion can also affect how much vitamin B12, or thiamine, the body absorbs, which can harm other organ systems, especially the brain. Since the liver processes most of the alcohol that enters the body, it is one of the most affected organs. People who drink heavily, or struggle with alcohol use disorder, are more likely to develop liver damage. This includes alcoholic hepatitis (inflammation of the liver), hepatic steatosis (increased fat in the liver), cirrhosis (irreversible scarring or destruction to liver tissue) and liver cancer. After the liver filters most toxins out of the body, the kidneys are responsible for removing much of what is left. However, if the liver does not filter enough alcohol out of the body, it will reach the kidneys and damage that organ’s ability to process toxins. The kidneys are also responsible for keeping enough water in the body; when poisoned by too much alcohol, the kidneys are not able to prevent dehydration. Additionally, high blood pressure can damage the kidneys, along with other organs. Drinking too much also inflames the pancreas, leading to pancreatitis. Chronic inflammation of this organ interferes with digestion, causing abdominal pain and diarrhea, which often do not go away without medication. Excessive drinking can lead to osteoporosis, or the thinning of bone from loss of calcium. This can lead to a higher risk of bone fractures later in life. Alcohol use disorder can also damage bone marrow, preventing the production of red blood cells, and this can lead to problems clotting, or excessive bruising. Fewer red blood cells also leads to anemia, a condition in which oxygen is not carried through the body properly; this causes lightheadedness, shortness of breath, and fatigue. Chronic problem drinking can damage several areas of the brain, leading to neuropathy, or numbness in the extremities, as well as short-term memory loss, disordered thinking, and dementia. Low thiamine levels from alcohol use disorder can also lead to Wernicke-Korsakoff syndrome, commonly known as wet brain.Heavy drinking can also lead to seizures because it changes how GABA receptors function. When a person who is physically dependent on alcohol is not able to drink, or tries to stop drinking without medical supervision, those pathways are more easily excited, which can lead to anxiety, panic attacks, and seizures. Additionally, liver damage harms the brain by leading to hepatic encephalopathy, or swelling in the brain due to unfiltered toxins. Areas of the brain damaged by excessive drinking include the cerebellum (controls motor function), the limbic system (controls memory and emotional processing), and the cerebral cortex (controls the ability to think, plan, and interact with others). Many people who struggle with alcohol use disorder display symptoms of depression. A 2005 study conducted in New Zealand found that, for many people struggling with alcoholism, their depression cleared up when they became sober. 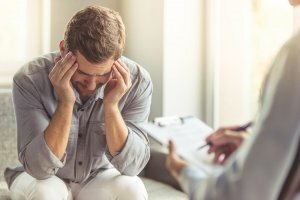 If a person struggling with alcohol use disorder stops drinking via a professional medical detox program, enters a rehabilitation program based in therapy, and maintains sobriety while their symptoms are still in the early stages, they may be able to reverse much of the damage to their body. The brain, in particular, seems especially able to heal damage. Other systems, like the immune system and the pancreas, may not be as able to heal damage. However, even if a person is not able to reverse damage caused to their body by problem drinking, stopping alcohol consumption and managing the addiction can still stop the progression of the disease.